"Come, ma vhen'an," Suledin's gentle voice breaks the peaceful quiet of their secluded forest home as he glances over his shoulder at his beloved family. Before him, between two of the large trees that framed the water's edge, a strange ethereal veil had formed; not unlike the unworldy fog that frequently coated the floor of the forest, yet it seemed to have an almost water's surface effect to it. It had opened in the early hours of the morning, whilst the trio and their companions slept. It stirred Asala first, and Suledin was quick to wake soon after, the strange otherworldly energies tugging at them, drawing them in. He carefully woke his family and escorted them towards the portal. "It will be okay, I promise. There is something new and wonderful on the other side, and I think it is time we returned this forest to the wolves." He smiles at them warmly, giving Adahlen's cheek a little nudge as she stared up at him with sleepy eyes, before he gives Milly's cheek a light kiss. Asala stands at the portal, green ethereal tail wagging happily, and she steps through first. The shimmering waves of the portal wash over him, feeling cool and wet against his warm flesh, but he emerges on the other side as dry as when he'd stepped in. It is a peculiar sensation, certainly, but not something he would deem unpleasant. He notices Asala ahead of him already, seated on a sandy beach and sniffing the otherworldly air curiously, but she remains her neutral green colour, and so he remains calm. He steps away from the portal only a few paces, the water from what he assumes is the ocean lapping only ever so slightly as it is disturbed by the power emanating from the giant ring; he turns to watch it, awaiting his family. Tired olive eyes blinked straining to make out Suledin’s shape while the morning light trickled through the canopy above their heads. Ellie in turn rolled over using her paws to cover her face from the light. Blinking once, twice, and a third for good measure slender legs stretched out the muscles within my legs waking as I slowly rose to stand. ”Good morning to you, too.” I mused with a tired yawn unsure why we would be up at such an hour I’d gotten used to sleeping in. Though I could feel a strangeness in the land, something I had never quite felt before and I noticed Ellie also had the same thoughts. I couldn’t quite remember feeling something like that when we claimed a spot for the night. I wondered what it could have been, but I followed Suledin’s lead while Ellie followed behind. Ellie turned her yellow eyes on Asala who’d wandered through the portal first. ”I’ll see you on the other side.” she spoke to the family. Casually standing back to watch the equines wander through the strange door. I could feel a warmth against my cheek where Suledin had placed a precious kiss. ”Adahlen I will be right on the other side waiting for you.” I spoke gently placing a kiss against her own forehead. With that I began to step out from the forest leaving it to the wolves allowing the coolness to wash over my skin. It was almost as if I’d dipped into a cool lake in the beginning of the summer moons. An odd sensation that I cannot quite say whether it was something I enjoyed. I closed my eyes bracing myself for whatever lay on the other end of the mystical portal. Only to listen to the push and pull of waves lapping against a shore and my heartbeat hammering in my ears. My cloven hooves finally meeting what I had assumed was the ground. Slowly opening olive eyes I found myself standing on an unknown beach. Suledin transfixed on the waters that outstretched as far as the eye could see. ”What is this place?” I asked before I felt a thump to my rear limbs where I still stood within the portals way. Moving away by a few steps to turn and see what exactly had come through relieved to see it was just Ellie looking rather dazed. A gentle smile crossed my features reaching down to nuzzle her furry head. At least wherever we were, we were together. Suledin waits patiently to watch his family come through the portal whilst Asala makes quick work of investigating the area around them. He smiles as he sees Adahlen's head poke through, her branches almost fully grown now though there is still a ways to go, and he watches her race down and prance about in the water. She most definitely reminds him of how he was in his youth, always ready to explore - and to get into trouble. "I'm not sure, " Suledin turns his head back to look at Milly, answering her question, but offering her a smile, "Perhaps we should go find out, hm?" "Uh, da'len... There is something else you need to see," Asala nods her head upwards to the sky, indicating for their eyes to follow. The uncertainty in her voice does nothing to comfort Suledin as he tilts his head to look into the sky. He immediately understood why she'd sounded as she had. There was a giant planet clearly visible in the sky! He looked down at Asala, frowning in confusion, but she just looked back at him with a shake of her head, answering his silent question: are we dreaming? Adahlen, too, had looked at the sky and now had a wide-eyed expression, but with the way that she nuzzled up against her mother, Suledin could tell she was unsure; even, perhaps, scared. "Come... We won't learn anything about this if we just stand here," His voice is warm and gentle, encouraging, as he gives Milly's shoulder a light nudge with his muzzle and indicates they should go and explore the beach, "It looks like there's more than one portal, and they look active too... Perhaps we are not the only new arrivals. Maybe this place has natives of its own, too." You cannot treat a wound without knowing how deep it goes. You cannot heal pain by hiding it. It was quite different here, than it was in the forest beyond the portal. There the sun had only begun to shine its bright rays penetrating the canopy high above our heads. Yet here it seemed the sun was at its peak the bright light cascading down amongst us. It was warm, more comforting even. Though as I regained my composure from the oddity that had been the entrance to this new land I couldn’t help but see Suledins facial features before he spoke. Following his gaze to find that of a metallic mirror-like creature if one could call it that. It was an animal I had seen before, but that was certainly not what I had remembered them being. As my mind began to wonder I heard the soft thuds of Adahlen’s steps pulling me back to the reality that was around us. Turning my cranium to better view her small fawn spots and the limbs that grew with each day as she began her own adventure on the beach. Part of me wanted to call out, to warn her from venturing too far. But I remember what it was like when I was a child. That need to search, to explore our new surroundings. Turning bright olive eyes toward Suledin as he spoke, ”Of course.” I offered in return coupled by a smile. Though before our own family adventure was to start Asala offered a hint of what none of us were expecting. As we gazed upward into the sky where normally just one bright ball of light sat within, there was another. Some other world easily seen by the naked eye, and something I had never before witnessed. I was so distracted by the scene placed before us I hadn’t heard Adahlen come back, only the feel of her smaller frame nuzzling into my own did I get drawn back to reality. The only reality I felt like I had known after seeing this giant planet on the border. Lowering my cranium avoiding the limbs reaching out to place my cheek against the filly’s neck. It was the only thing I could think of doing while the words escaped me. What was I to say? Placing my olive gaze on Suledin as he pressed his nares against my own skin, ”Let us be off then.” I offered in gentle tunes giving a nudge to Adahlen. Something in Suledin didn't sit right, and Asala could feel it too - in fact, her usual green colouring kept looking like it was trying hard not to flicker into yellow. The moment he'd seen the planet in the sky, he'd felt his heart race and something inside began to panic. The realisation that they were.... wherever they were... stuck on some strange alien planet with no apparent way back home. He'd been lured in by the portal, beguiled by the idea of having somewhere new to explore, new things to see and many things to learn. He hadn't thought about being trapped here. But he tried to keep himself as calm as possible, for his family's sake, but also for Asala's; he didn't want to overwhelm her own state of emotions with his own. And so he forces a smile, although small, and begins to walk away from the portal and further onto the beach. It is as the sand becomes dry that Asala seems to pick up a scent, and she shimmers a vibrant green all of a sudden, ears perked, and turns to look at Suledin. Suledin stares at her almost as wide-eyed as he had when looking at the planet on the horizon. How could Nylah be here too? How did they so often find themselves in the same places as each other? A frown creases his brow as his features harden, "Follow his scent." He states to her curtly, and with a nod, Asala continues to follow the familiar scent along the beach. The sounds in this place are strange, too, as there are no natural sounding animal calls as one would expect around a beach; rather, they sound a little more metallic. It is somewhat unsettling, but it is something Suledin has already drowned out as he focuses on keeping himself from panicking. Adahlen, on the other hand, is curious as she watches a strange bird flying overhead. It looks about as large as what Vallas was, but it is both dark and shiny at the same time as the light reflects on its strange wings. Or maybe it was a trick of the light? Maybe it was Vallas?! She pulls away from her mother's side absent mindedly, standing still and staring up as it soars, before her legs carry her off down the beach. Since coming through the portal, she hadn't seen Vallas. Had he not been with them when they'd stepped through? Her little heart began to race with mild panic as she worried where he was; what if he'd been left behind? Would he wait for them? What if they never came back?! She picked up speed as the terrible thoughts raced through her mind, eagerly trying to catch up with the bird. Suledin called for her but she paid no heed. He didn't want to put off finding Nylah; he needed to know how the other got here, if his family was here, and if he knew of a way to get back. Asala paused as Suledin stopped, the stallion turning to look at Milly desperately, "Go after her. Ellie can track us afterwards. I'm going to go find Nylah." And with that, he turned back to Asala and broke into a smooth canter, the spirit wolf running ahead as she followed the feathered stallion's scent into the strange new world. I was off in my own thoughts of this new, strange, landscape. The only thing that sparked some sort of familiar was the ocean as the water rolled forward on the sandy beach then receded back out before it was back on the sands shuffling it around as it always had. Even the skies were different here with a sort of planet that was hanging within it almost seemed close enough to reach, far closer than the moon had ever been. Peeling my olive gaze away from the waters the sounds, scents still assaulted my senses. I caught a near panicked look on Suledin’s face before it had been washed away by a mission that lingered in his mind. I turned my cranium gently to the side cocking it in a manner of curiosity of what had just unfolded while I was off in my own little world. From the corner of my eye I watched as our daughter, the little dark fawn, stand staring into the sky. Half of me thought she may have been looking at the planet that seemed so close. Though before I could speak she had been off in a flash. Kicking up the sand as she pushed her little frame as fast as it could possibly go. It was within that moment my eyes darted from Suledin to Adah as she traveled down the beach, and to be honest before I’d known it, my own slender limbs picked up cloven hooves kicking up the shifting sands as I chased after her. I hadn’t connected what exactly was going on until I heard Suledin calling after. Realization struck me on why he’d had such a panicked look on his own features, Nylah the feathered stallion was here in this strange world. Perhaps he knew what sort of place this was? color=#2b2d29”Be careful!”[/color] I called after not bothering to turn around refusing to let Adah out of my sight knowing that this was a strange world after all and no one knew what lingered around the corner. Still my slender legs picked up after her following as she made her way with everything that she had to chase what seemed like a bird in the sky. To be honest I wasn’t sure whether it was a bird, or perhaps something different altogether. Though I knew I wasn’t going to let Adah find out by herself. Ellie on the other hand watched the scene unfold between the bonded couple and their offspring. Lazily she watched Suledin head off in one direction while Milly and Adah had gone in another. 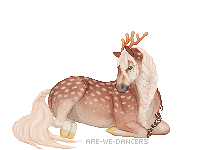 Slowly she raised herself from her resting place and began her trek after the two fawn colored equines only stopping enough to watch Suledin and Asala disappear into the distance. Returning her eyes on her fading companion Ellie began to pad off after her picking up her own speed to keep them within her view. Not quite knowing what to expect here in this rather.. Mechanical world. She can feel her legs burning, the pain of her muscles being forced beyond their usual limits coursing through her as the adrenaline had taken over, but she was determined to chase after the bird. It hadn't crossed her young mind yet that, if it had been Vallas, he would not keep flying away from her. Whilst she could hear the sounds of her parent's voices behind her, she paid no mind, focused solely on chasing after the huge creature in the sky. However, her pursuit is forced to an abrupt end as the beach comes to an end at the base of a cliff. She slides to a halt and stares up, watching the bird as it circles above with wide pleading eyes. But as it gradually moves lower, as if it is trying to find a place to land upon the cliff face, she can more clearly make out its strange metallic feathering and she can feel her heart sink just as her legs tremble beneath her and she slides down into the sand. The sound of hooves behind her only vaguely reaches her consciousness, but she knows it's her mother, she can feel it's her presence, and immediately she looks over her shoulder with large sad eyes that appear as if they could spill with a river of tears at any moment; despite the love and comfort that her family provided, she felt partially empty without Vallas, and being so young and inexperienced, she just doesn't know how to handle that feeling. "Banal'ish..." She whimpers quietly, tilting her head to look back up at the cliff face to see that the mechanical bird had landed on a ledge about half-way down and was now staring down at the strange new visitors. "It's not him..."
|| Banal'ish = not him. Waves crashed on the shoreline drowning out the thuds of Adah’s hooves as she sprinted across the coastline. Sand kicked up by her hooves caught in the wind as it traveled stinging my olive eyes. Squeezing lids shut I couldn’t help the tears that began to form a fine line before dropping across my cheeks. The tears were not from sadness, or panic, but trying to rid my eyes of the foreign particles that had found themselves lodged in my eyes. Still my limbs moved chasing after the fawn colored yearling afraid to let her out of sight in a world as strange as this. It may have once resembled a place we had known, but judging from the shimmering metallic creations it was far from what we would know. but I could see Adah wasn’t as in a panic as she had been, but instead was sad. A cloud of doubt dropped around her features, the smiling brilliant child now held eyes full of sadness. Lobes flicked forward listening to the soft, broken, tunes. Turning my attention to the bird that had landed on the cliff face. The whole eagle had been covered in what almost looked like metallic paint, but I realized it was a living machine. I realized then what Adah had chased the mechanical bird for. I couldn’t keep my own heart from sinking as I turned back to the fawn painted child, ”I know sweet child.” I responded in soft, caring, tunes. I reached for Adah pulling her into an embrace knowing how she must feel. ”We will find Vallas, I promise.” I offered in a whisper while my words were meant to be comforting, but was stated more as a promise to myself. I couldn’t help but feel the heartache reaching out but only falling further and further behind. Though I wasn’t quite sure how we would find him, or even if he had came through the portal as well. There had to be away, there is always a way. Vir samahl la numin, vir lath sa'vunin. Adahlen pulls her legs toward her body, doing the best she can to curl into a ball where she can tuck her face away, hiding it from the world as she struggles to understand why he was not with them. Asala was here. Ellie was here. Why not Vallas?! She can feel her mother try to comfort her but remains rigid, not wanting to be moved from her spot. Whilst she does want comfort, she also doesn't, and the mixed emotions are doing nothing but confusing her. Where had he been whilst they'd slept, when the portal had appeared? Had he gone out hunting? He sometimes did that during the early mornings, when little creatures often thought themselves safe in the dim light. But why had her father ushered them through the portal without making sure they were all there first?! Slowly but surely, little flares of anger and betrayal start to sour her tongue; such a foul taste, that sickens her, but she can't seem to fight them away. She doesn't know how. After sulking for a short while, she uncurls herself and gets to her feet, pulling away from her mother's reach, and beginning to walk back up the stretch of beach she had run down, "Let's go..." She mutters, head hanging low as she seems to show no sign of interest in the world around as she normally would, under normal circumstances. She just wants to get away from the beach, from the portals. We sing, rejoice, we tell the tale. We laugh and cry, we love one more day.